Since I originally identified problematic claims in Bugs, Features, and Aggressive Incompetence, the saga of updates surrounding Eric Hunsader’s comical attempts to hide his shoddy research and lie his way out of getting caught was becoming so long I moved it to this page where I can maintain the ongoing proofs of malice (in reverse chronological order) for posterity without cluttering up my original posts. Enjoy the lols. Earlier this summer, Captain Nanex started to realize that he had cried wolf one too many times when financial journalists completely stopped taking his calls — or in his case the near-psychotic emails he would spam to unwitting reporters a half dozen times a day. I imagine this type of industry-wide ostracizing is mentally taxing for someone who takes everything personally. Indeed, with his so-called research now considered no more relevant than an episode of Ghost Hunters, he has turned to broader political punditry in order to maintain some relevance (and perhaps friends?). Unfortunately for our well-coiffed companion, a quick google of any one of those lines immediately turns up results showing it is a complete hoax from 1999. 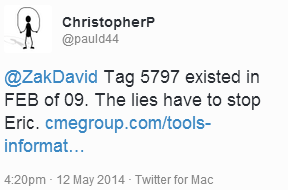 The tweet links to a personal webpage of a professor of sociology, David. 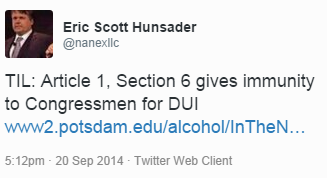 J Hanson, who provides no citations to back up his purported legal expertise. Coincidentally, Hanson’s personal pile of unsupported schmuckiness has existed in the same format since the late 90s (perhaps a trend?). The Supreme Court interpreted the language “in all Cases, except Treason, Felony, and Breach of the Peace” to encompass all crimes. Williamson v. United States(1908). Tracing the origins of the clause to parliamentary privilege, the Court found this identical language was used to qualify Parliament’s privilege from arrest so that the members of Parliament were not immune from criminal prosecution. The Court concluded that the Framers’ use of the identical phrase, without any explanation, indicated that Congress’s privilege was to have the same limitation regarding criminal actions as did the parliamentary privilege from which the language was borrowed. The clause, therefore, does not provide Congress with any immunity from criminal prosecution. 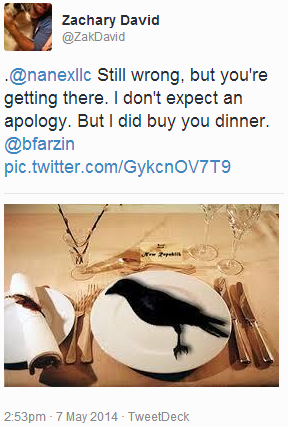 And so, this is where we find Dear Eric in the Fall of 2014: trying to support hoaxes with other hoaxes. Keep chasing those ghosts, big guy. Kirilenko doesn’t use 3%, he uses 7%. And no surprise, the HFT group in Kirilenko’s paper isn’t nearly as angelic as the HFT group in the SEC/CFTC report. 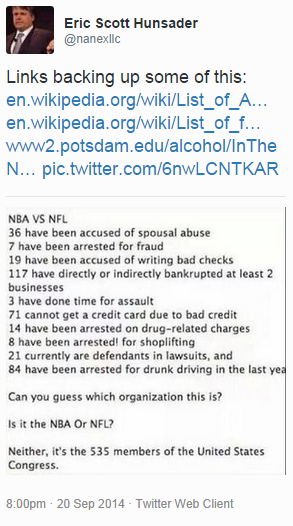 But note how Kirilenko’s numbers don’t add up either: before dividing, there were 195 Intermediary accounts (16+179). 16 out of 195 is 8.2%, not 7%. Did Kirilenko also experiment with numbers to see what fit best? This looks like a case of data mining to us. Perhaps Eric did read this footnote but simply didn’t understand what it meant. Allow me to explain. Classification in statistics often deals with how to place an individual into a single category based on many different variables — e.g. insurance companies classifying someone as “high risk” or “low risk”. There are many techniques for classification and some can be pretty math-fancy. Luckily this one is straightforward. In the CFTC report, they developed a classification system to discern “High-Frequency Traders” from “Intermediaries” using data from May 3 – 5. 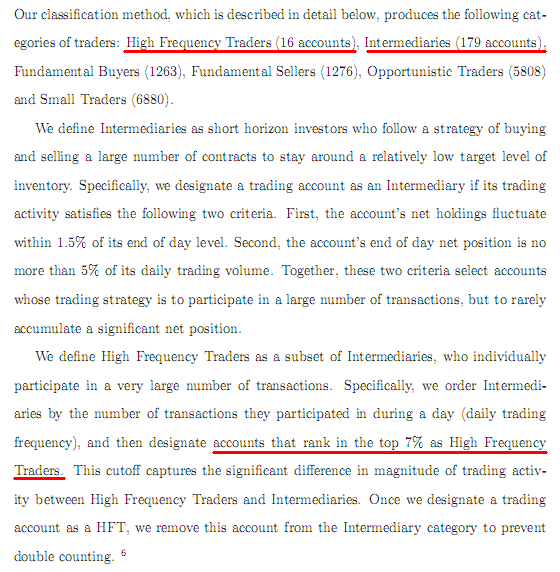 Classifying the top 7% of intermediaries as HFT’s represented a statistically significant difference in trading activity between the two categories. It’s not the 7% itself that is the cutoff, it’s the trading activity (which just happened to be 7% for that day). In the CFTC’s classification system, that level of trading activity becomes the cutoff point for whether to classify someone on May 6 as an HFT or an Intermediary. May 3 – 5 was the calibration period. You’ll see that 15 HFT traders during the calibration period accounted for around 3 times more trading volume than the 189 intermediaries. This is the significant difference in trading activity that created the cutoff point. When those same rules were applied to May 6, the relative ratios of the volume and trade statistics were about the same but the group sizes changed slightly. This is actually the exact opposite of data mining. This is the correct way to use “in sample” versus “out of sample” data. Clearly Eric needs to understand what he’s looking at before crying foul. He might even be surprised to find that the official CFTC report features the exact same table. Nothing spooky going on here. Basically he tried to claim that the ability to figure out aggressive orders wasn’t available at that time. Unfortunately for the big man, responsible Tweeters were all over it within minutes. 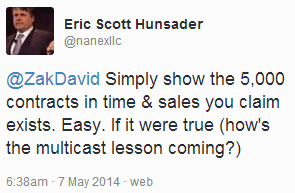 Since then Hunsader has been nervously deleting all of his tweets about this issue. It’s not just bold. It’s not just stupid. It’s not just wrong. 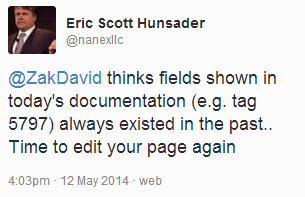 This is willful and malicious abuse of open, honest research and the people who attempt to conduct it. 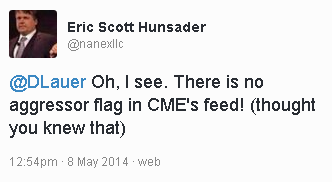 Nanex has shown itself to be far beyond just a simple group of clueless self-promoters. Twitter is quite a remarkable tool. Not only was I able to publicly confront (and embarrass) Hunsader, but at the same time I was reaching out to a community of extremely knowledgeable and interested people. Nice to meet everyone! Given that we don’t have access to individual order data, I wondered what it would take to actually test Hunsader’s claims. 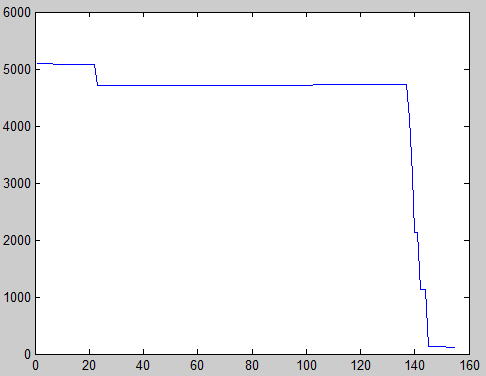 Markets are generally slow at that time of night, so I figured I would concede if 5,000 contracts were cancelled in a single update. But what I found was even better. 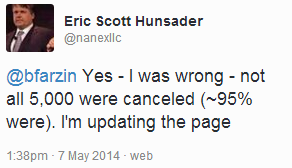 The problem: there wasn’t 5,000 contracts to cancel! This person had been getting filled on his order the entire time. I have attached the tick by tick order books for ESZ3 on Wed, 16 Oct 2013 07:00:00 to just after the cancellation: OrderBook ESZ3. Hunsader’s analysis is fraudulent. QED.